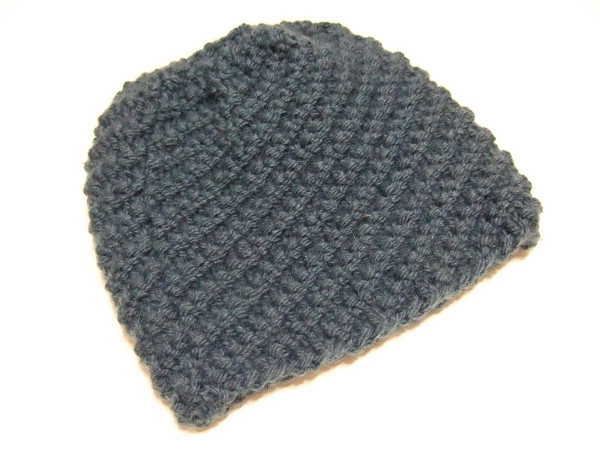 This is a beanie hat for bulky yarn with a diagonal purl texture. Directions are given for seven sizes. Cast on this number of stitches and join to knit in the round. Divide stitches in multiples of 4 between double pointed needles or needles for a magic loop. Repeat each instruction across the round. 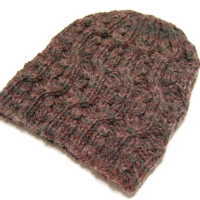 This is a very basic beanie hat for bulky yarn in four sizes. Cast on this number of stitches and join to knit in the round. Divide stitches between double pointed needles or needles for a magic loop. 18 month = 56, Divide with multiples of 8 on each needle. Small Child = 60, Divide with multiples of 10 on each needle. Small Adult = 72, Divide with multiples of 12 on each needle. Large Adult = 80, Divide with multiples of 16 on each needle. 11/19/2014 – corrected division of stitches multiples. Changed Young Adult cast on to 72 and changed Crown for Young Adult. 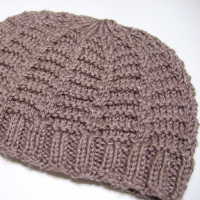 This hat has an interesting texture with a little cabling that can be done without a cable needle. Directions are given for several sizes. This version is for straight needles. Go to this page for the in-the-round version. c2f = cable 2 front – Slip the next stitch onto cable needle and hold in front of work. Knit the next stitch from left-hand needle, knit the stitch from the cable needle. c2b = cable 2 back – Slip the next stitch onto cable needle and hold in back of work. Knit the next stitch from left-hand needle, knit the stitch from the cable needle. The c2f and c2b can be made without a cable needle. There are several methods for doing that. I have a video of my method. Rows 3 to 8: repeat the first two rows three times to complete 8 rows of ribbing. Cut the yarn with several inches to work with. With a yarn needle, pull the yarn through all the remaining loops, secure, stitch seam and weave in end. Afghans for Afghans provides hand knitted wool socks and hand knitted or crocheted wool mittens, hats and sweaters to children in Afghanistan. 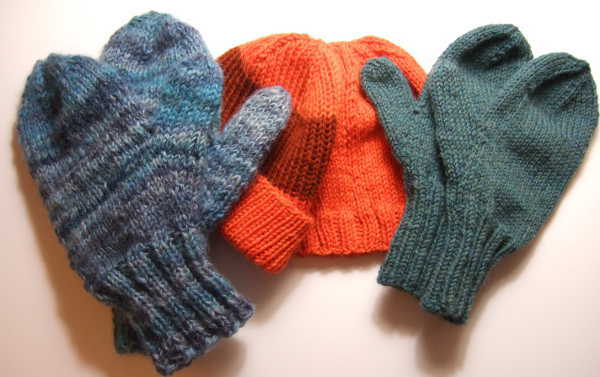 In January 2013, I donated two sets of mittens and two hats. 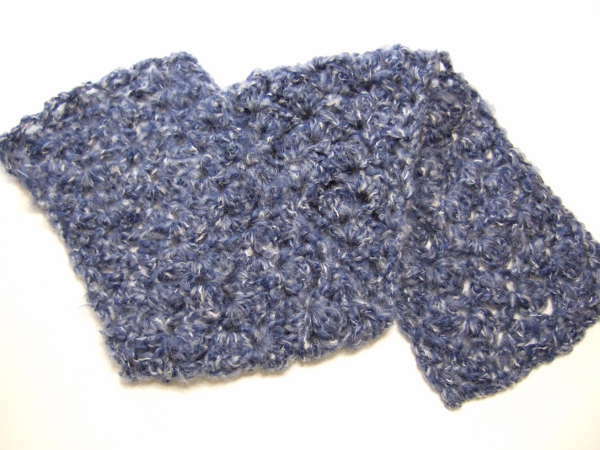 The blue mittens are made from handspun wool made by the friend of a friend. 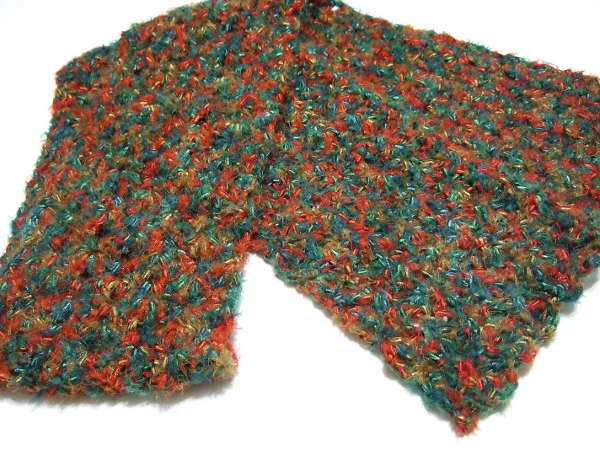 The green mittens are made from Patons North America Classic Wool Worsted. Both are made from the pattern Basic Pattern for Children’s Mittens. I didn’t have the label from the orange yarn, but know it is 100% wool worsted weight. The brown yarn is Cascade Yarns Cascade 220. The had with the brown band is from the pattern Basic Ribbed Hat and the solid orange hat is from the pattern Simple Lines Baby Hats. During December 2012 the office in which my husband works had a drive to collect gloves, hats and scarves for Warm Hands, Warm Hearts. This yarn is Caron Simply Soft Heather. 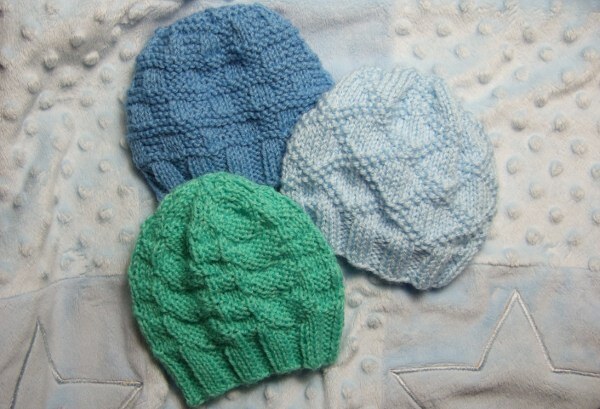 The pattern is Climbing Frame Hat. This was made from a single skein of Red Heart Light & Lofty Multi that I had in my stash. The pattern is Quick Granny Check Scarf. I made this scarf and hat from some Red Heart Plush Solid in my stash. The scarf pattern is Quick Lacy Shell Scarf. The hat is just a simple roll brim knitted hat I made to use up the rest of the yarn. This scarf is made from some Yarn Bee Topkapi I had in my stash. The pattern is Quick Shell Scarf. I had these two skeins of Lion Brand Chenille Sensations in my stash and made this simple scarf. It is just double crochet and I used any last yarn for fringe. This hat is made with Lion Brand Wool-Ease. 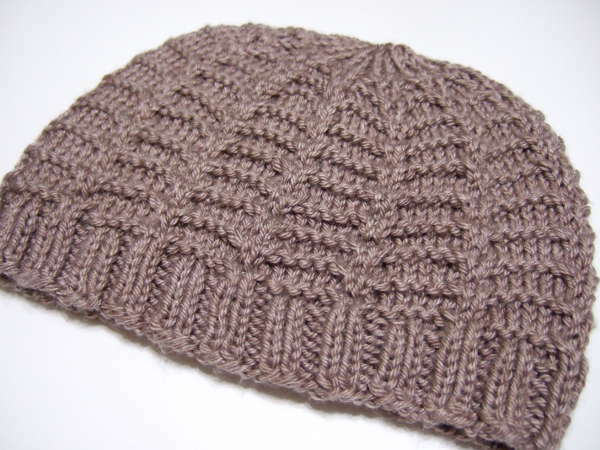 The pattern is Cable With a Twist Hat. The scarf on the left is made of Bernat Boucle remnants I had in my stash. The one on the right is made of Jo-Ann Sensations Marvel. Both are with the pattern Quick Crazy Block Scarf. These are all scarves I had made some time ago. 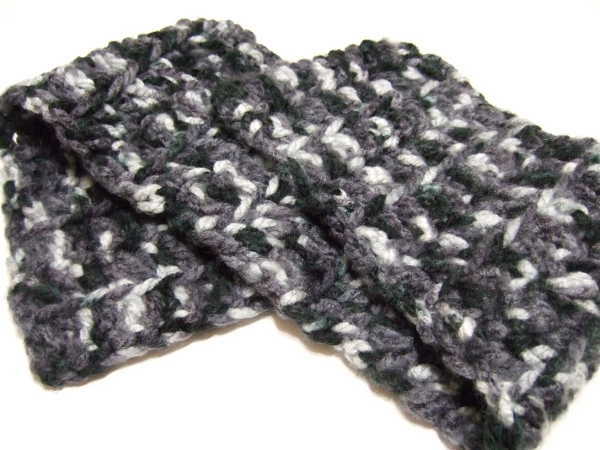 These are both made from single skeins of Lion Brand Jiffy. The pattern is Quick V-stitch Scarf. This one is made from Lion Brand Jiffy Thick & Quick. The pattern is Tall Tale Scarf by Lion Brand Yarn. 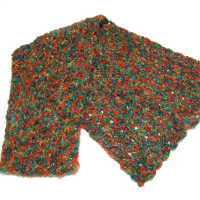 One skein of homespun or bouclé or other knobby style yarn can easily be transformed into this quick scarf. This scarf does not require finding chain stitches, even for the first row. The lacy shells keep the scarf light even with a heavier yarn. The example is made in Patons Divine. The example is 7″ by 40″, but can be easily adjusted to make other sizes. The example was made with 142 yards/100 grams of bulky yarn. If another weight of yarn is used, use a hook size appropriate for the yarn. Instead of a beginning chain, the scarf is begun with a first row of chain and tr spaces. The example was begun with 7 tr/ch spaces. Row 1: Ch 3, tr in first ch, (ch 3, tr in last ch sp) until you have made desired number of tr/ch spaces, making an odd number of them. Row 2: Ch 3. Without turning the work, make a dc over tr just made. Working across the tr stitches, (4 dc, ch 2, 1 dc) over next tr, ** skip 1 tr, (4 dc, ch 2, 1 dc) over next tr . Repeat from ** across to the last tr stitch. Work (1 dc, ch 1, 1 dc) over last tr. Row 3: Ch 3 and turn. Dc in ch-1 sp. In each ch-2 sp across the row, make 4 dc, ch 2, 1 dc. (Dc, ch 1, dc) in ch-3 space at end of row. Last Row: Ch 3 and turn. Dc in ch-1 sp, ch 2, sc in ch-2 of shell, ** ch 3, dc in sp between shells, ch 3, sc in ch-2 of next shell. Repeat from ** across all the shells. Ch 2, (dc, ch 1, dc) in ch-3 space at end of row.Finish off and weave in end. 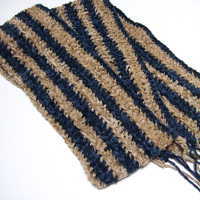 The scarf can be made in a solid color or can be made with any number of color changes. The best way to make a color change is to finish all but the very last pull through of the two loops of the last stitch of a row. Cut yarn with a few inches of tail and join with new color next to stitch. Pull new color through last two loops. Weave in ends. Make good use of those single skeins of homespun or bouclé or other knobby style yarns that have been just sitting in your stash. This scarf does not require finding chain stitches, even for the first row. Every side has a fun and pretty zig-zag shape. 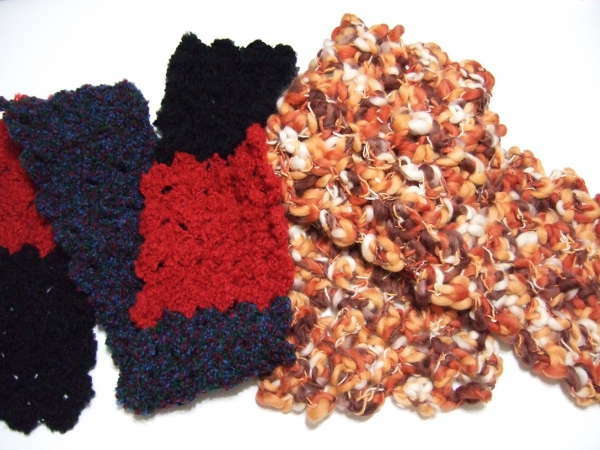 The scarf on the left is made from Bernat Soft Bouclé, a bulky weight acrylic yarn. 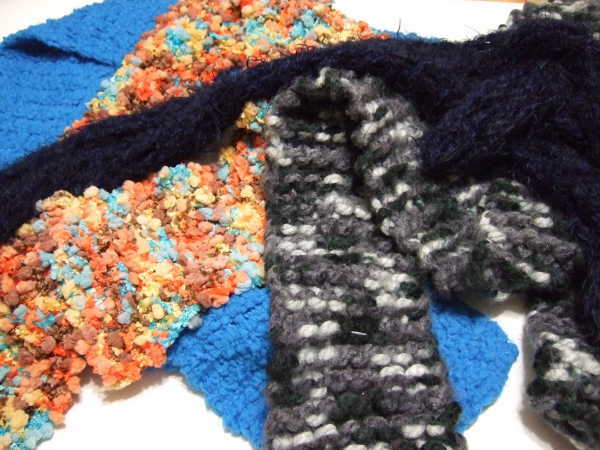 The scarf on the right is made from Jo-Ann Sensations Marvel, a super bulky wool yarn. 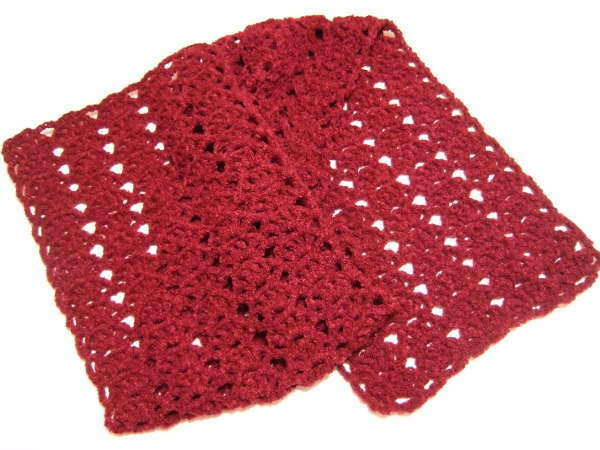 Size: The scarf on the left is 6″ by 45″. The scarf on the right is 8″ by 48″. Yarn – The scarf on the left was made with 148 yards/80 grams of Bernat Soft Bouclé. 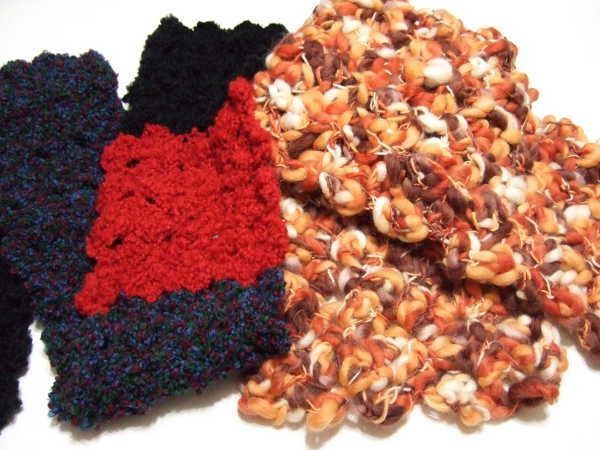 The scarf on the right was made with 196 yards/200 grams of Jo-Ann Sensations Marvel. 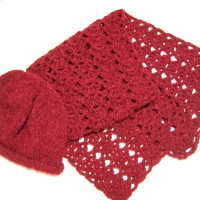 The scarf on the left was made with Size I (5.5mm) crochet hook. The scarf on the right was made with Size N (10mm) crochet hook. Use the appropriate sized hook for the yarn you choose to use. Instead of a beginning chain, the scarf is begun with a first row of blocks. The scarf on the left was begun with 4 blocks. The scarf on the right was begun with 5 blocks. Start with the number of blocks to make the scarf whatever width you desire. 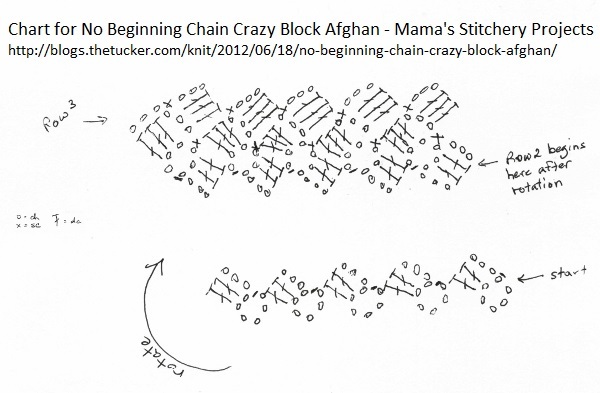 There is a photo tutorial, chart and a video demonstrating the technique of this pattern. Row 1 Block: Chain 6. Join with a sl st in first chain. Chain 3. 2 dc in ch 6 sp. Make these blocks until desired width. Row 2: Ch3. Without turning the work, rotate so that the following is worked across the chain loops created in the first row. In each of the chain spaces, (sc, ch3, 3dc) in ch sp. Row 3: Ch 3 and turn. In each of the chain spaces, (sc, ch3, 3dc) in ch sp. Repeat row 3 until afghan is desired length. Finish off and weave in end. This is a great use of those single skeins of homespun or bouclé or other knobby style yarn you have in your stash. This scarf does not require finding chain stitches, even for the first row. The lacy shells keep the scarf light even with a heavier yarn. 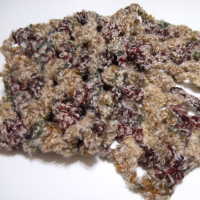 The example is made in Red Heart Plush, an Aran weight plush textured yarn. Size: The example is 10.5″ by 49″, but can be easily adjusted to make any size. The example was made with 230.7 yards/141 grams of Red Heart Plush. Size I (5.5mm) crochet hook, but use hook size appropriate to yarn if other yarn is used. The example was made with 9 tr/ch spaces. 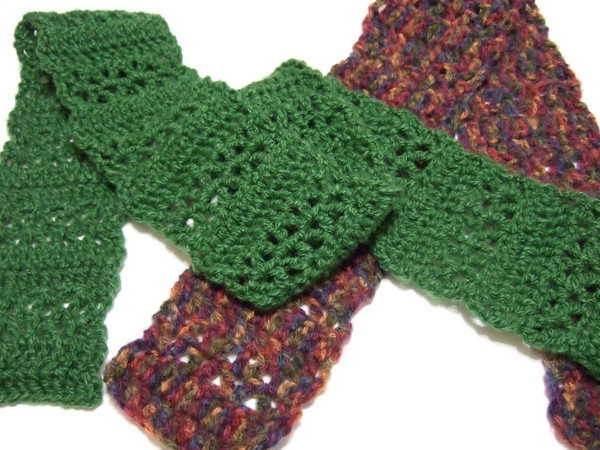 You can make the scarf narrower or wider by decreasing or increasing the number of tr/ch spaces. Row 1: Ch 5, sc in first ch, (ch 3, tr in last ch sp) odd number of times, ch 3, dc in last ch sp. Row 2: Ch 1. Without turning the work, sc over dc just made. Working across the tr stitches, ch 1, shell over first tr, ch 1, ** sc over next tr, ch 1, shell over next tr, ch 1. Repeat from ** across all the tr stitches. Sc in ch 5 sp at end of row. Row 3: Ch 4 and turn. Sc in first ch-1 sp of first shell, ch 3, sc in third ch-1 sp of same shell, ** ch 3, sc in first ch-1 sp of next shell, ch 3, sc in third ch-1 sp of same shell. Repeat from ** across all the shells. Ch 2, dc in ch space from row before shell row. Row 4: Ch 1 and turn. Sc in ch-2 sp. Ch 1, shell in first ch-3 sp, ch 1, ** sc in next ch-3 sp, ch 1, shell in next ch-3 sp, ch 1. Repeat from ** across all the ch-3 spaces. Sc in ch 4 sp at end of row. Repeat row 3 and 4 until scarf is desired length. For straight sides – End with a row 3. Finish off and weave in end. For scalloped sides – You will need to have an odd number of shell rows. End with a row 4. In same ch sp, ch 1, shell, ch 1, sc. Working across the ch-4 spaces on the side, (ch 1, shell in next ch-4 sp, ch 1, sc in next ch-4 sp). At the last ch-4, after the sc, also work, ch 1, shell, ch 1, sc. Working across bottom of afghan in the ch-3 spaces, (ch 1, shell in next ch-3 sp, ch 1, sc in next ch-3 sp). After the last sc, in same sp also work, ch 1, shell, ch 1, sc. Working across last side of dc stitches, (ch 1, over next dc, ch 1, sc over next dc). At last corner also work, ch 1, shell, ch 1. Join with sc from the beginning of the last row 4. Finish off and weave in end. 1/23/2017 – changed “over” to “in” on row 4. Do you have some single skeins of homespun, bouclé or ribbon yarn and you haven’t found a purpose for it? Crocheting with textured and specialty yarns can be frustrating because sometimes it is hard to find stitches. This scarf does not require finding chain stitches, even for the first row. 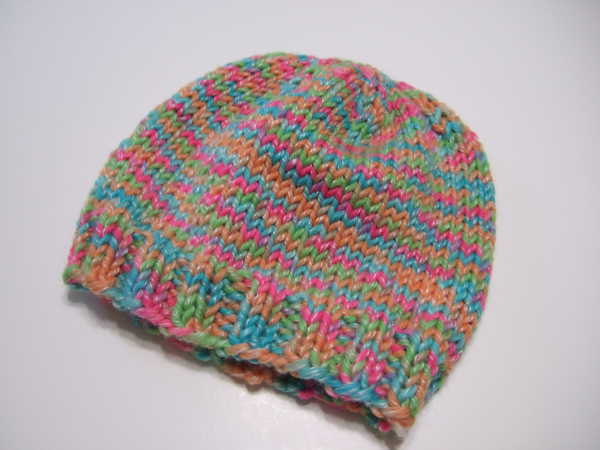 The example is made with Yarn Bee Topkapi, a fuzzy ribbon yarn (DK weight). Size: The example is 6″ wide and 60″ long but can be adjusted to any size you like. Yarn – example was made using 262 yards/200 grams of Yarn Bee Topkapi. Size I (5.5mm) crochet hook or size appropriate to yarn used. There is a tutorial video available for the similar blanket. The example was made using 7 beginning chain and tr spaces. Make the scarf wider by adding more beginning chain and tr spaces. You need to begin with an odd number. Row 1: Ch 3, tr in first ch, (ch 3, tr in last ch sp) even number of times. Row 2: Ch 4. Without turning the work, 2 dc over tr just made. Working across the tr stitches, (sc, ch 3, sc) over next tr, ** (2 dc, ch 2, 2 dc) over next tr, (sc, ch 3, sc) over next tr. Repeat from ** across all but last tr stitch. Over last tr, 2 dc, 1 tr. Row 3: Ch 3 and turn. Sc in space between tr and dc. ** (2 Dc, ch 2, 2 dc) in ch-3 sp, (sc, ch3, sc) in ch-2 sp. Repeat from ** across to last 2 dc and turning chain. (Sc, ch 1, dc) in space between 2nd dc and turning chain. Row 4: Ch 4 and turn. 2 dc in ch-1 sp. (Sc, ch 3, sc) in ch-2 sp, ** (2 dc, ch 2, 2 dc) in ch-3 sp, (sc, ch 3, sc) in ch-2 sp. Repeat from ** across to last ch-3 sp. (2 Dc, 1 tr) in last ch-3 sp. Repeat row 3 and 4 until scarf is desired length. Finish off and weave in end.